A truly unique and spectacular 4 bedroom property steps from a breathtaking white sand beach with luxurious amenities to make for an amazing island holiday. 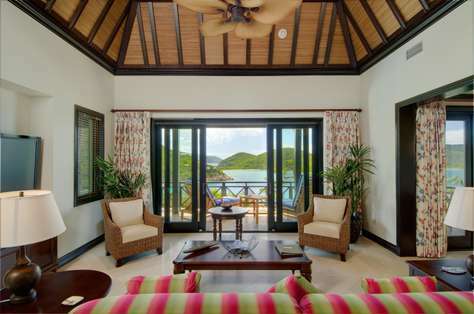 Situated within Little Trunk Bay Estate Sol y Sombra provides an enchanted private oasis for families and friends. The villa is accessed from the driveway through an intricately carved Balinese gate. Follow the steps down to the main pavilion where you will catch your first glimpse of the spectacular pool terrace and spacious great room which contains entertainment system including satellite TV, projector, and home theatre system. The 12 seater formal dining room is perfect for relaxing lunches after a morning at the beach or graceful evening dining. The gourmet kitchen is well equipped for enthusiastic chefs with Viking range, sub zero refrigerator and numerous appliances to hand. A study area is found just off the dining area with computer, internet access, satellite TV and half bath. Follow the pool terrace to the North and you will find the master king bedroom pavilion with walk-in wardrobe, private terrace and bathroom with outside shower. To the South is a two bedroomed pavilion built around the natural boulders of which The Baths are famed. The lower level offers a twin bedroom with bathroom and verandah. Follow the staircase up to a second master bedroom also with bathroom and pergola terrace with spectacular views. Tucked behind the main pavilion sits a tennis court, overlooked by the guest pavilion containing a third master suite with kitchenette and living area also housing two daybeds which are great for children. Another private terrace offers privacy for guests. The beach is accessed down a private pathway just a skip from the villa through a further set of Balinese gates. The beach is excellent for sunbathing and relaxing while the sea offers amazing snorkeling opportunites. 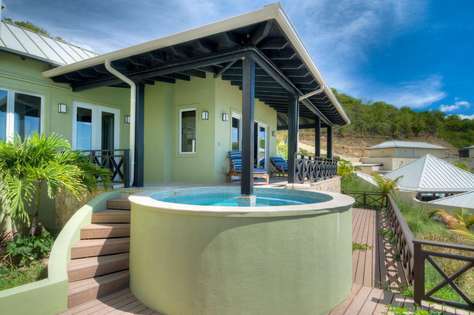 Sol y Sombra offers gracious accommodation within an exclusive enclave in one of the premier locations in the British Virgin Islands, if not the Caribbean. 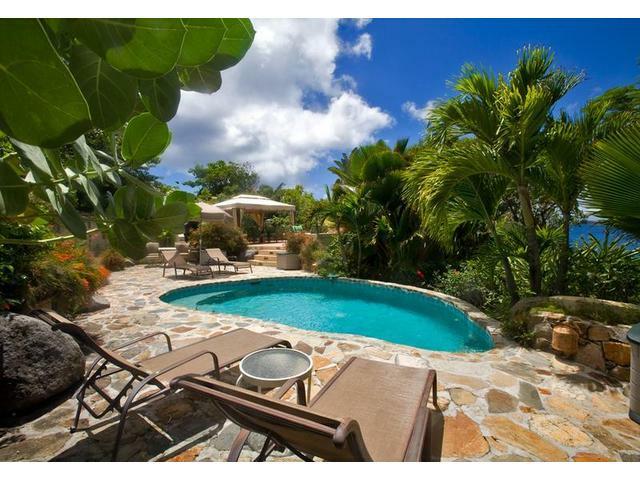 A spectacular newly renovated 4 bedroom house situated in Virgin Gorda's prestigious Little Trunk Bay Estate, less than a five minute walk to several white sand beaches and to The Baths. 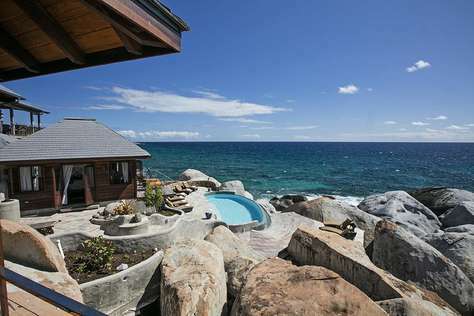 Nestled into a cluster of boulders, On the Rocks offers luxurious accommodations within one of Virgin Gorda's most desirable locations. 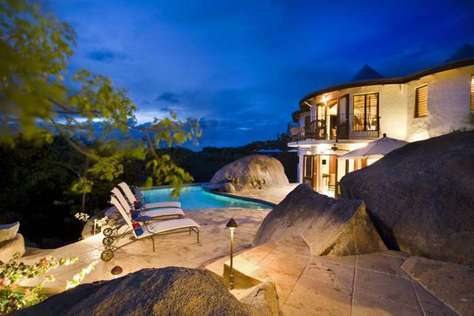 The villa is accessed from a stone walkway illustrating Virgin Gordas famous granite boulders. 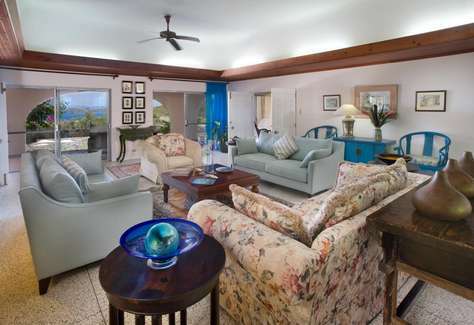 The front door opens into a circular warm tropical living room graced by a richly stained 14' exposed beam ceiling, and sea grass furniture accented by cobalt blues and colours of the Caribbean. The open air living room extends onto the pool terrace and takes advantage of the beautiful views of the Sir Francis Drake Channel, ocean breezes and spectacular sunsets. The gourmet kitchen is equipped with a Wolf range, granite counter tops, Liptus wood cabinets, stainless steel appliances and halogen task lighting. A fully equipped wet bar with built in ice maker is located just off the living room. On the Rocks provides indoor and outdoor dining complete with a custom outdoor charcoal grill and is the ideal setting for intimate gatherings, for that special dinner, luncheon or barbecue. 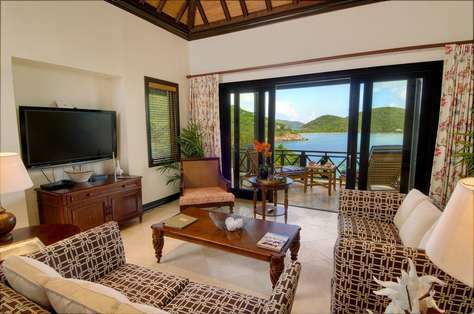 The four luxury bedroom suites exude elegance with a Caribbean flare. Each suite has air conditioning, flat screen TV and DVD player, iPod doc , outdoor shower, robes, electronic safe, hair dryer, magnifying mirror, fine linens, plush Euro-Top mattress and blackout curtains. Located in the main house, Rising Sun is a king bed suite with a peaked ceiling with exposed beams adding a rustic Caribbean charm. Two sets of French doors opening up to a private patio tucked in a lush garden setting. The large outdoor shower is surrounded by lush tropical vegetation for maximum privacy. A separate pavilion, a few steps from the main house houses this beautiful suite in a garden setting. 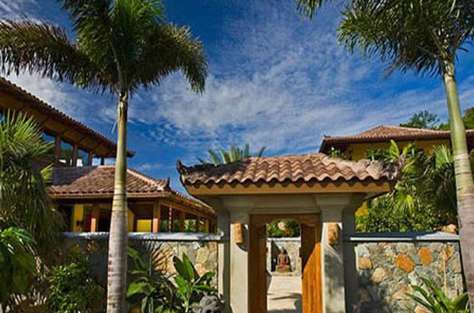 A large outdoor shower is nestled in the boulders and is surrounded by lush vegetation for utmost privacy. Trade Winds offers twin beds that can be converted to king. Just a short walk from a quite white sand beach sits Drake's View. This villa can be rented as a whole for up to 8 people or as individual unit. Each bedroom has their own private bath with large windows and plenty of ocean breeze. The villa has up to date appliances and comfortable funishings. 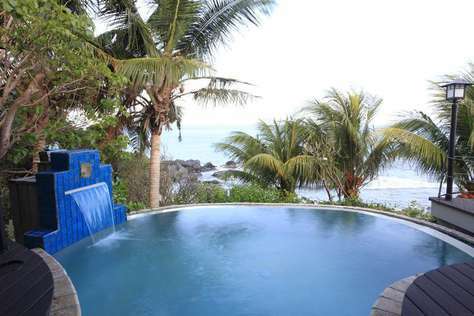 The villa includes a pool, beach access and satellite tv throughout. 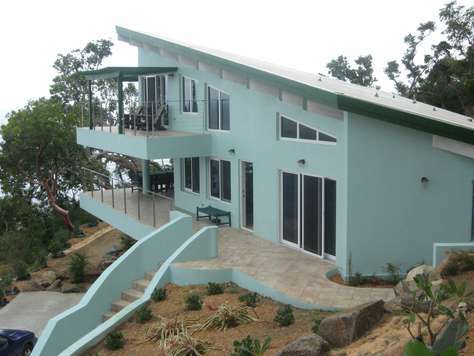 Seaglass Studio is a very private, fully air-conditioned, guest suite perfect for a couple. The efficient but spacious studio design offers a kitchenette, bedroom, lounge area and bath. Step outside and you are poolside, the views from every vantage point in the guest house or on the patio are spectacular. The main house has an open-concept living area, with a bright and airy fully-equipped kitchen with custom bamboo cabinetry, glass-infused concrete countertops and breakfast bar, a spacious living room and dining area, and is the perfect space for entertaining. 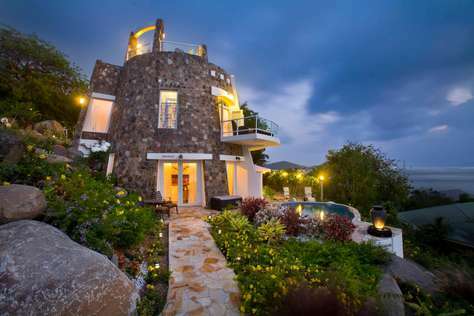 A spiral staircase leads to a mezzanine, with a queen-sized futon for extra overnight guests (additional fee applies), and an outdoor balcony, perfect for stargazing and taking in amazing sunsets and views of surrounding islands. Both bedrooms open directly onto the expansive patio with pool, lounge chairs, covered outdoor dining and new tropical gardens; the master bedroom has a large, screened-in outdoor shower. Both bedrooms in the main house are air-conditioned. Surrounded by flowering tropical gardens set among boulders, this villa is uphill from the historic 19th-century stone ruins of the former Nail Bay sugar plantation. This non-smoking property also features central air-conditioning, satellite TV, and WiFi. Up in the Rooftop Suite, through french doors, is a private slate-tiled balcony with cushioned chairs, wonderful for watching sunsets. Just outside, a stone staircase curves up to Sugar Mill Villa's topmost level, the Rooftop, where your second private pool and terrace overlooks the sea, blue skies and green islands in the distance. The Rooftop terrace offers tables, a sofa, cushioned chairs and chaise lounges, plus a second big gas grill for poolside cookouts with sea views and cool tradewinds. Cool slate floors add a rich look, lighting is well done inside and out, and interesting decorative items collected on Caribbean travels add a lighthearted flair to the interiors. From the sun deck, glass sliding doors open into the villa where the kitchen, dining and living areas share space. Theres plenty of indoor entertainment on offer in the living room. Snuggle on the sofa and watch your favorite DVD on the satellite TV, connect with the world via Wi-Fi. When you start to feel hungry, you can quickly rustle up a snack in the gourmet kitchen or head to the popular nearby restaurant at Nail Bay resort. Climb three steps up from the living room to a raised bedroom area, where you dont even have to get out of your king-size bed to admire the lovely sea view. You can watch TV here too. Adjacent is a dressing area, closet, and the bathroom with a double-sink vanity and rain shower enclosed in opaque glass and tile. 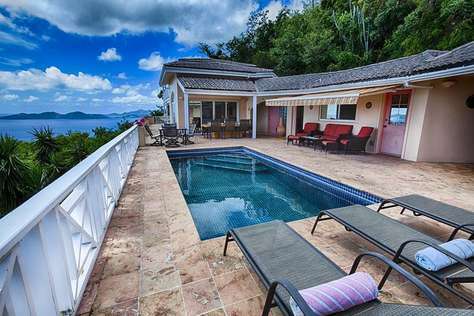 Villa Sugar Mill, is a 2-bedroom villa located on Nail Bay within minutes of the beach and shopping, and a short walk from restaurants. This unique villa is a replica of an island sugar mill from days past. 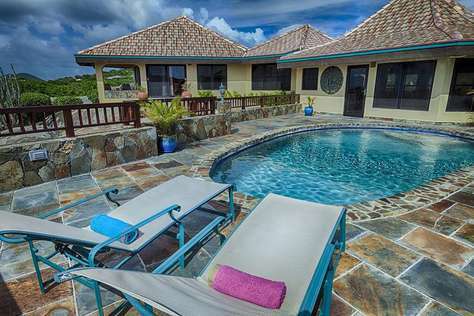 Constructed of stone, this bi-level villa features 2 small swimming pools and overlooks vistas of Savannah Bay, Little Dix Bay, and Long Bay. 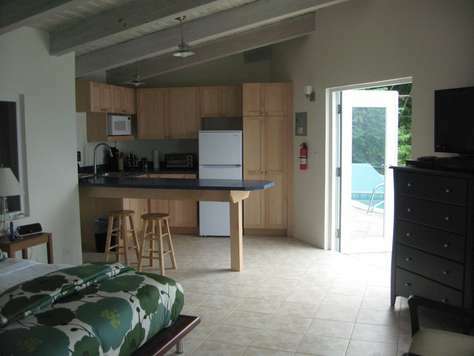 This property may be rented either as a 2-bedroom villa or as 2 independent 1-bedroom studio suites. 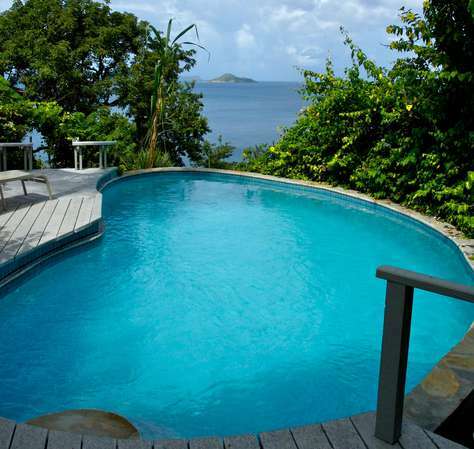 This property boasts a swimming pool on each level overlooking blue vistas of Savannah Bay, Little Dix Bay and Long Bay, so each Suite has its own private pool. Both Suites are compact and charming one-bedrooms, each of which feature a pleasing floorplan, central air-conditioning, a king bed dressed in fine linens and a wonderfully-equipped gourmet kitchen with a wide array of chef's tools and cookware for those who love to cook. 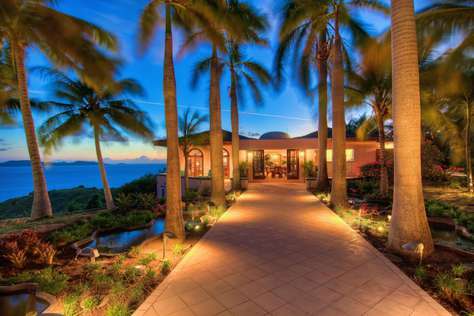 Sea Song is an exquisite beachfront property located a few minutes’ walk from Long Bay beach. The villa is ideally situated only a short drive from the Sugarcane restaurant and fifteen minutes’ drive from the airport, ferry dock and the marina shopping area. The villa comprises the main house, which includes the en-suite master bedroom with king sized bed and alfresco shower. An open plan kitchen leads to the air-conditioned great room complete with dining area and living room. Passing through the sliding glass doors you will find yourself on an expansive outdoor deck, ideal for alfresco dining under the stars or sundowner cocktails by the freshwater pool. Walking through lush tropical gardens will lead to Sea Song's two other en-suite bedrooms. The Pirate Suite comes with twin beds that can be configured into a king if required. The adjacent Mermaid Suite also comes with a king bed which allows Sea Song Villa to accommodate comfortably up to six guests. The newly built outdoor Cabana complete with a love seat swing, tables and chairs entices you to sit and dream or sip on a refreshing cocktail as you listen to the sound of the waves, and watch the sun go down. 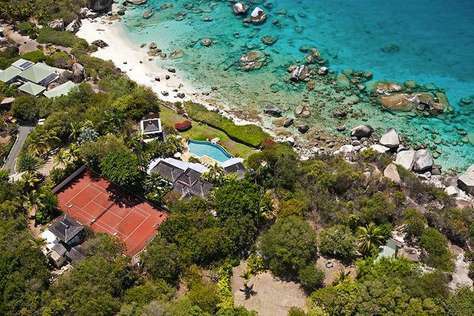 Located on an acre of private gardens and grounds, and within walking distance of the famous The Baths, the Villa Mon Repos is a rare find on Virgin Gorda in the British Virgin Islands. A truly estate-like property, it boasts a long list of amenities in addition to its premium setting. This property boasts some of the finest views, and all of them can be enjoyed right from the pool or the terrace. Sit at your al fresco dining area and sip coffee or cocktails while gazing out to sea. Wander down to your private pavilion for some peace and quiet, or enjoy the comforts of the central great room just off the terrace. Designed as a real showpiece, the great room features amazingly high wooden ceilings and an open floor plan that ensures you feel those delicious sea breezes even if you are in the kitchen or lounging in front of the TV. There is a formal lounge area, a formal dining spot, and a large living room. The gourmet kitchen is within this airy and inspiring space, and is framed by a comfortable breakfast bar. At the end of the day, relax in one of the amazingly luxurious bedroom suites. There is a master bedroom with a veranda and enormous en suite bath. There are two queen bedrooms, also with verandas, but which share a large and opulent bathroom. And there is a lower level queen apartment that features the oversized bedroom suite along with a kitchenette and separate lounge and dining area, and with direct garden access. 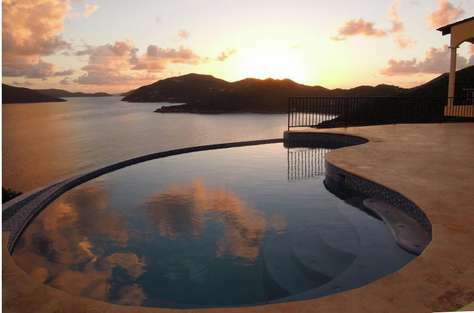 Sunset Watch, a private two-story home, is perched over Nail Bay Beach with the expanse of ocean and green islands beyond, and is comprised of two separate floors, the Upper and the Lower Deck levels. On the Upper Deck's level, a Chinese terracotta soldier welcomes you into the large, L-shaped covered verandah, plushly furnished with a sink-into sofa and armchairs, a dining table for six, and a lazy hammock - this is the romantic spot to laze away idle hours reading, napping or watching yachts pass by day, savoring a tropical sunset, or stargazing by night. The Upper Deck level is a compact but incredibly well-equipped pièd-a-terre for two: this Level offers a true gourmet kitchen complete with many appliances from breadmaker to Cuisinart, wine cooler, wet bar, and a generous array of chef's gadgets and cookware, spices and cookbooks. A herb garden is located behind this house where you can harvest fresh basil and lemon grass. A kitchen island separates all this from a small living area with a sofa facing the 180-degree ocean view. Screen and glass sliders on two sides open to the covered porch outside. Adjacent is the king bedroom with a generous bath ensuite which features double sinks, a separate WC with a bidet and an exotic alfresco shower. On the Lower Deck level of Sunset Watch, a shaded garden patio ushers you into the Lower Deck's sitting room/kitchen area. This level also offers central air-conditioning, a very well-equipped kitchen with a variety of appliances and cookware, a king bedroom adorned with a handpainted mural on its wall, an ensuite bath which features double sinks, a jacuzzi bathtub with shower, an exotic alfresco shower, and a separate WC. The garden patio just outside is set up for alfresco dining. Privately situated on four gated acres, this brand new 5000 square foot, Balinese-inspired villa has four bedrooms and four and a half baths in the main house and an additional Guest House appartment with its own kitchen, bedroom and bathroom. The property features stunning 180 degree ocean views, heated infinity pool, hot tub, outdoor gas fire pit, second floor gallery with bar and pool table, media room with large flat screen TV and surround sound, office with fax/pc/wireless internet, a fully equipped gym, air conditioning in all primary rooms. Spa services are also available. 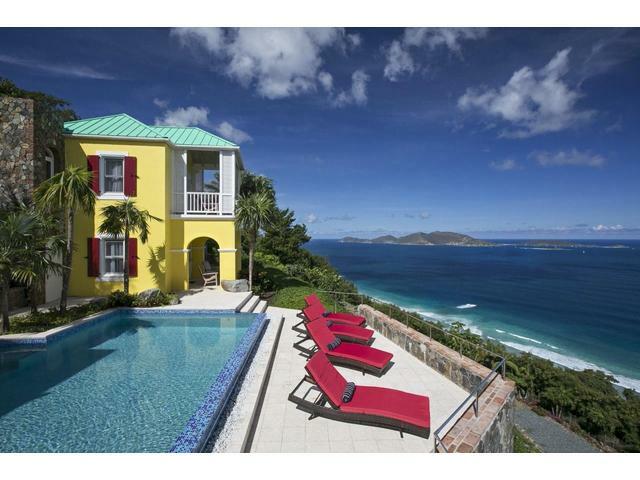 Located on the east end of Tortola, Golden Pavilion Villa is a 7 minute walk from secluded Little Bay Beach and a 15 minute drive to Road Town. Direct ocean access is available from the property for the adventurous. BEDROOMS: The villas bedroom suites are all self-contained and include private baths with dual vanities, showers, walk in closets with safes, air-conditioning and fans. 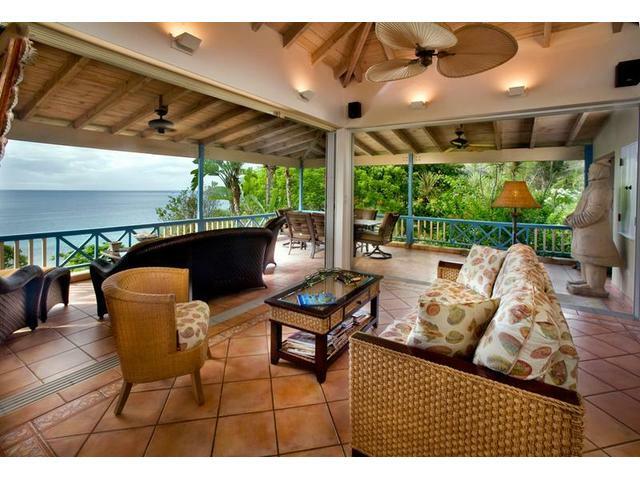 All bedrooms have French doors to exterior decks with stunning Caribbean views and trade winds. The oversized master bath is equipped with a Jacuzzi tub and private outdoor shower with dual heads. Each room is playfully decorated with its own color schemes; aqua blue, coral, moss and sky. 5 bedrooms in total if you include the guest cottage. The moment you drive into the gated grounds , you will be enchanted by its glorious gardens set on 10 acres, creating a private, park-like setting. The estate home contains three air conditioned bedroom/bathroom suites and a choice of several outdoor living spaces enhanced by lush landscaping. A staircase descends through gardens from the parking area to the main pavilion. The two-storied main pavilion offers on its main level a gourmet kitchen, powder room, a formal dining area for 8 persons surrounded by french doors which open out to a second alfresco dining patio under a garden gazebo. The great room is outfitted with satellite TV, music, books, a wet bar with a mini-fridge and comfortable furnishings. Tall French doors open to a semi-circular terrace above the pool. A staircase leads you down a few steps to the pool (which can be heated by advance request) and stone-tiled sun deck. A shaded gazebo is adjacent. Situated on the far side of the main pavilion is the secluded master pavilion, housing the large air conditioned king master bedroom. On the opposite side of the main pavilion is a walkway through gardens to the air conditioned guest bedroom pavilion, offering the Blue Suite and the Green Suite. At an elevation of 1500 ft. above the sea, it is cooled by almost constant hillside trade winds, and its high locale provides wonderful views for miles into the distance. You can drive down to the beach in a few minutes. It is a unique offering for families and friends seeking an intimate experience within a very private garden setting, close to nature. The villa's gourmet kitchen is perfectly equipped to allow for family meals or the more rigorous demands of a gathering of up to 100 guests. Adjacent to the kitchen, is a formal dining area; 10 may be seated comfortably, and the dining table affords a delightful ocean view. The living room provides comfy accommodations for relaxing and conversation; indirect and recessed lighting fixtures bathe the environment in just the right amount of ambiance to encourage a most convivial meeting of the minds. Just out of doors is the covered patio with a dining table for 8, along with outdoor sofas and chairs for dining alfresco, reading, or stepping away for a private chat. The Master Suite at Allamanda Estate is more than generous, with its large custom-made wood four-poster bed and sitting area. You'll still find this bedroom a most spacious sanctuary as you enjoy the ocean vistas with all of its islets through glass sliders and windows. 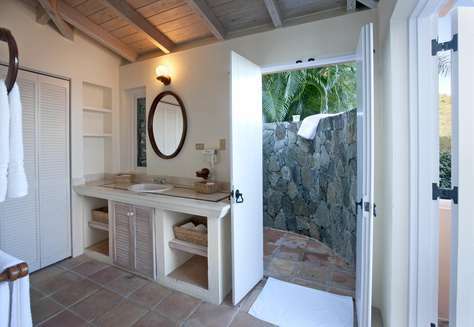 The Master Bath has a separate bath and shower, with discreetly placed windows that give a view to the ocean and the islands, while allowing the Caribbean sunshine in. Three more bedrooms, each with private baths, are pleasingly decorated and welcoming, providing panoramic views. All of the bedrooms have air-conditioning, recessed ceilings, ceiling fans, and indirect lighting. Finally, the real centerpiece of the Estate, the pool! Enveloped in lush greenery and flowering plants, the large pool is hidden completely secluded, with a stone patio and is only steps away from a guest bedroom with kitchenette. Plenty of lounge chairs for sun worshippers as well as a covered verandah with more cushioned chairs for those wishing to enjoy the pool in the cool shade. 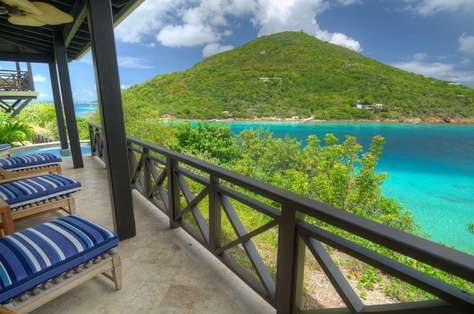 With sweeping views of Long Bay Beach and a private hillside location, Alfresco is one of our best situated Tortola villas. The large tiled pool deck with lounge chairs is the perfect place to spend a relaxing day out in the sun with a cold drink or a good book. When youre ready to cool off, take a dip in the infinity pool, which also features changing LED lights for nighttime swims. 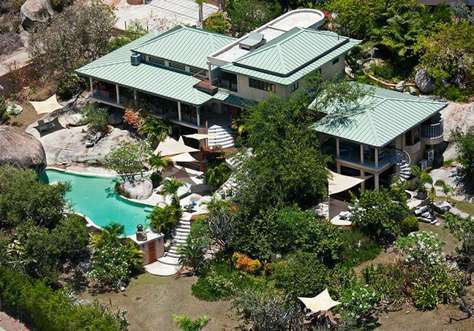 Located on a large hillside, this newly built villa is divided into two pavilions separated by the pool and sundeck. Indoors, the great room boasts vaulted ceilings and fantastic views from large windows and glass sliding pocket doors leading out onto the deck. Alfresco features a fully equipped kitchen complete with stainless steel appliances, and you can enjoy your meals in the open-air dining room complete with panoramic ocean views. If youre in the mood for a quiet night in, the villa also features a large flatscreen TV in the living room complete with a DVD player and satellite. Up to six guests will be comfortable in the villas three bedrooms, which are nicely spaced between the pavilions for added privacy. In the two-bedroom pavilion, the master bedroom is accessed via a beautiful staircase curving up from the entrance; it features a king-sized bed, reclaimed teak furniture and a spacious bathroom with an open tiled shower. Sliding doors lead you onto a private verandah with ocean views. Directly below the master suite, the second bedroom has access to the pool terrace and twin beds which can be made up as a king, with advance request. The third bedroom is especially private and is located in the main living pavilion, accessible by a staircase off of the pool deck. 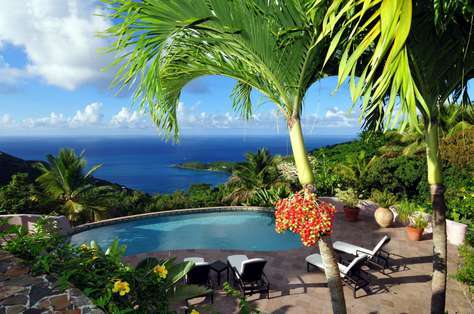 naCapri Estate offers Italian-style architecture and one of the most beautiful panoramic views in the Caribbean. The 5000 sq. foot estate includes 4 bedrooms, 4.5 bathrooms, two-tiered pool deck with Infinity Pool, Gazebo, multiple covered and open porches, and a special 'Place in the Rocks' patio. The Estate combines old world charm with modern conveniences of high-speed Internet throughout, home theatre, and music sound system. 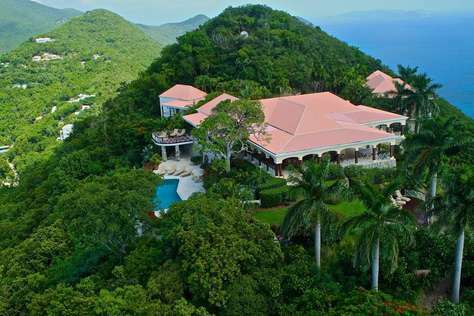 Perched high on the hill in Cooten Bay, AnaCapri Estate gets the most wonderful Caribbean breezes which provide for comfort and relaxation in this natural quiet setting. There are four air conditioned bedrooms all with custom made mahogany furniture - all bedrooms are with ensuite bathrooms. The Office also has a Murphy bed. The Master Bedroom has a King Size bed, and the other bedrooms have Queen size European style pillow-top plush mattresses. The Master Bedroom and Office are on the second floor. The main floor has two bedrooms - each of these has a small balcony for enjoying a morning cup of coffee or evening drink. The five beds will sleep 10, plus there are two Queen size air mattresses in case the kids or friends need a little more sleeping room. Tucked behind a gate, a cobblestone driveway leads to an entrance graced by towering palms, a filigreed gazebo, and a flagstone walkway, which threads through tropical gardens and koi ponds. Double doors open into a large, airy foyer with a lush atrium garden of torch ginger and ferns. French doors in the sitting area open to the terrace and pool. The foyer has a powder room and leads to a drawing room with antiques, contemporary furnishings, and arched windows above cushioned window seats. An impressive ceiling dome inlaid with exotic woods is above the formal dining table, which seats 16 guests. Adjacent to the dining room is the well-equipped kitchen. Large glass doors open out to a terrace, reflecting pool, and gardens on 3 sides. Pathways of large, flat stepping-stones span a shallow koi pond and lead to the bedroom suites. Each bedroom has an ensuite bathroom. Five bedrooms have king-size beds, while the bedroom off the main entry has twin beds or a king-size bed. Two bedrooms have a connecting door, which is ideal for parents with children. Stepping-stones lead past a lion head fountain to an office and well-stocked library with 2 desks, while a stone bridge leads to a furnished living room. An exterior staircase curves down to a laundry room and game room with a full-sized pool table and, just outside, a patio and a graveled bocce court. Loungers and an outdoor dining table are located next to the pool. The entrance to the property is via a light and airy hall on the upper of the two levels. To one side of this hall is a beautifully designed king bedroom suite. To the rear of the suite lies a state-of-the-art bathroom with two appealing wooden washbasins and a full-size tub – and even when relaxing in that guests are able to enjoy breathtaking views of the ocean. From this bathroom, sliding doors lead to a secluded outdoor area with rainhead shower, and the suite itself also has its own private balcony from which guests can again enjoy views of the sea. On the other side of the hallway is a second king bedroom/bathroom suite with its own private balcony, and once again a panoramic view of the ocean. This bedroom additionally has a convenient kitchenette for preparing drinks and breakfast, or perhaps even a light meal. Also located on this upper floor of the villa is a laundry room for guests’ use containing both a washer and a dryer. Steps from the hallway lead down to the living room, the kitchen, the third bedroom suite, and not least the private plunge pool. 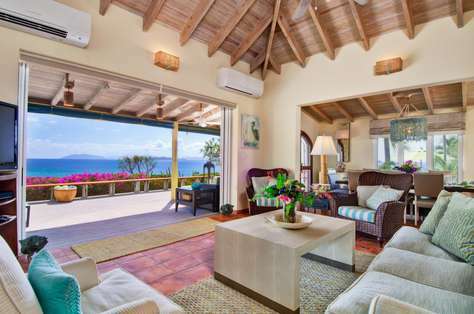 Approximately half of the living room has a full-height ceiling, and both its tall French doors and many windows, several of the latter level with the upper floor, allow in plenty of that famously relaxing Caribbean light. The glass doors open to a balcony, and from here further ocean views. Furniture throughout the living room is modern and comfortable. At the rear of the living area is an island-style breakfast bar, with space on one side for three comfortable stools, and on the other side of that the fully equipped kitchen with stainless-steel appliances, and the indoor dining table and chairs. There is sufficient space round the table for six to eat in comfort. Conveniently located French doors open out from the kitchen area to a covered wooden patio for alfresco dining under the stars. Also from the lower floor, large glass doors open to the plunge pool and deck area, the latter with thickly cushioned and contemporarily styled chaise lounges. Set at the far end of this floor, sufficiently far from the living area to afford occupants plenty of privacy and tranquility, is the third bedroom suite. This has essentially the same layout as the suite above, but no kitchenette. Also on this lower floor is a convenient half-bathroom. 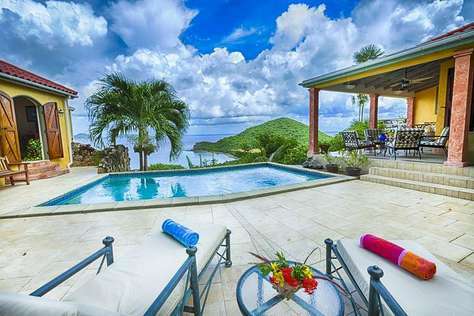 Ridgemont is a magnificent villa with amazing views of the ocean. 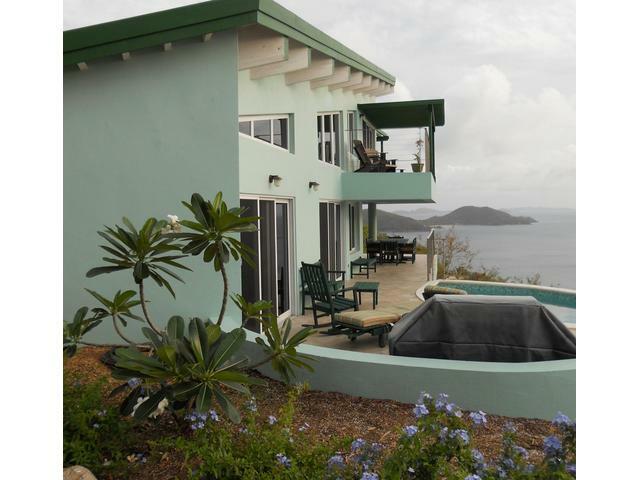 Located on the hillside it is set right above the white-sand beach at Long Bay on Tortola's north-west coasts. This property has been newly renovated and is perfect for any family or couples looking for a spacious home. it contains 10 bedrooms, all of which are fully air conditioned and en suite. Ridgemont has an incredible amount of outdoor space. furnished with sofas and a number of loungers as well as a a table perfect for alfresco dining and large enough to hold up to ten guests. Located high above the villa is a romantic gazebo, the perfect and final touch for this breathtaking villa. Unforgettable blue ocean views with a lovely sunset each evening are yours at this impressive property. 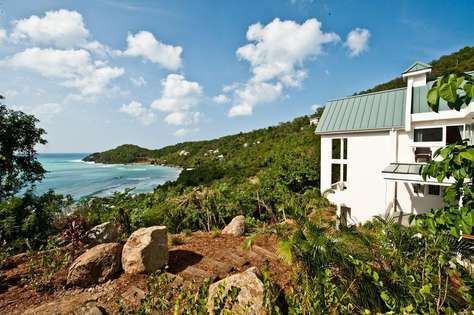 A road winds up into the breezy, green hills of Tortola's south coast to this stunning villa and to one of the island's most magnificent seascapes. Toa-Toa is built as five pavilions arranged around the dramatic pool set in a sunny deck. Three pavilions border the pool deck: the central Great Room offers a convenient wet bar, all media, and two very plush overstuffed sofas for lounging; eclectic teak pieces and a variety of accessories gathered from world travels accent this living area. One of Toa-Toa's four king master bedroom/bath suites - this one with air-conditioning, an indoor/outdoor garden shower and a romantic four-poster bed - is situated directly above the Great Room. On one end of the pool deck is the alfresco dining area in a shady lanai; it adjoins a country-style kitchen, with a billiard room just next door. At the opposite end is the third pavilion with a second air-conditioned king suite; the third and fourth king bedroom suites are in two additional pavilions (one above, which is air-conditioned, and one below), both easily accessible by steps from the pool deck. All four bedrooms are very spacious and well separated for serene privacy, and each offers its own individual mini-fridge, coffeemaker and a private covered balcony. Toa-Toa House is a serene and harmonious aerie kissed by cooling tradewinds and perched between vast sky and blue ocean, a perfect hideaway for reading and relaxing, although you may not be able to take your eyes off the entrancing views. 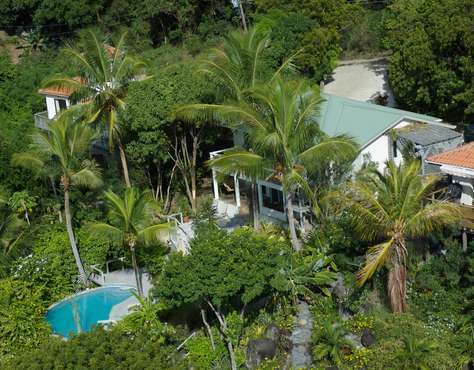 Toa-Toa House is conveniently located near Nanny Cay, watersports, Road Town's shops and restaurants, and is just a scenic drive away from your choice of beautiful North Shore and West End beaches. 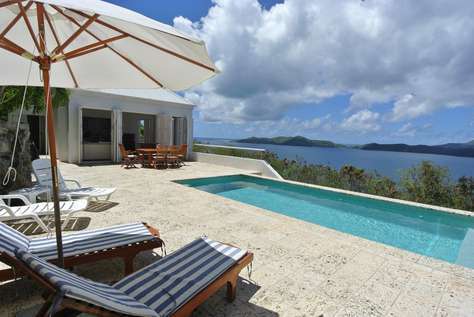 Tara has undergone a total refurbishment making this beautifully designed villa an ideal vacation rental. Tara sits at the end of a tranquil road for excellent seclusion. Overlooking magnificent sea views and perfectly sited to capture refreshing trade winds, this four-pavilion property is arranged hillside in a private garden setting. From the parking area, a staircase leads up to Tara's large terrace and to the pool. Tara's first pavilion, on the west side of the pool, offers a romantic air-conditioned king suite with a 4-poster bed, TV and DVD player, a large balcony and an outdoor stone shower. The larger main pavilion on the opposite side of the pool and terrace comprises of the Great Room where you can relax in the overstuffed sofas and watch your favourite TV programs or listen to the wide choice of music through the Bose surround sound system. Just outside the Great Room is a covered outdoor living area overlooking Smuggler's Cove and islands beyond. This wraparound verandah also borders the superbly-equipped gourmet kitchen, which opens to the pool terrace. Here you'll find a thatched tiki bar complete with convenient ice-maker, a small fridge for cold drinks, and a fully stocked honour bar, perfect for shady relaxation. Adjoining the Great Room on the east side is a covered garden pavilion with a fountain, set for dining with views through arched windows of the ocean beyond. Off the dining terrace is the third pavilion comprising of an office equipped with a computer with ADSL line and a printer/scanner/fax machine. The adjoining bathroom then connects directly to Tara's second air-conditioned queen bedroom suite, which opens to a private deck and small garden. Tara's fourth pavilion, an air-conditioned king suite with its own balcony, is just to the northernmost side and has an outdoor stone shower. Tara has been decorated in Caribbean colours, together with original artwork and eclectic pieces collected from world travels, with cool tile floors, brick, and native stone walls and planters surrounded by tropical, lush gardens. 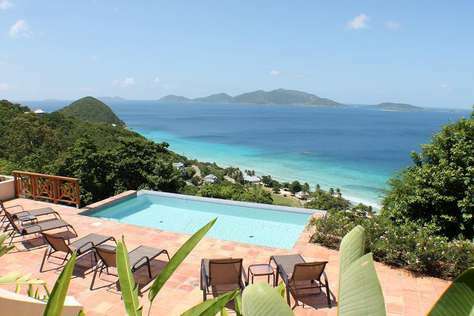 Summer Heights is situated on a private residential hillside location with long-distance panoramic views towards St John, Norman Island & Peter Island amongst many other smaller islands. A broad staircase of Mexican coral tiles leads you to the sunny enclosed courtyard and expansive deck and to the cobalt-blue tiled pool, all overlooking panoramic sea views. A roofed poolside loggia provides a beautiful setting for casual dining and viewing sunsets, with the adjacent gourmet kitchen and bar immediately at hand. Enjoy an early morning sunrise or yachts tacking up the Sir Francis Drake Channel - the views from this villa are simply breathtaking. A stylish curved glass brick wall separates the kitchen from the spacious Great Room. Four very similar bedroom/bath suites on two levels, decorated in ocean pastels, are just along the deck from the Great Room. The lower suites open onto a semi-shaded deck with double hammock whilst the upper two bedrooms open to private balconies. All bedroom suites have ocean views. Summer Heights is a relaxed and restful villa with many enhanced amenities such as a gourmet kitchen, an inter-villa intercom, welcome bar, a high-speed ADSL line and a full diesel standby generator. St. Bernard’s spacious main pavilion comprises the richly decorated Great Room, a Dining Room that seats 10, a professional Kitchen, and an air-conditioned Study with TV/DVD and Office Facilities. 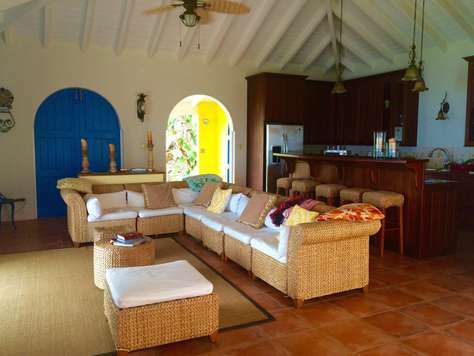 Arched doorways open out to a wonderful deep covered veranda, which span three sides of this pavilion, overlooking the Caribbean and Atlantic’s blue majesty dotted with green islands and cay's. Various seating and alfresco dining areas are scattered around the shady terrace, ready for gatherings, cocktails or a game of chess. 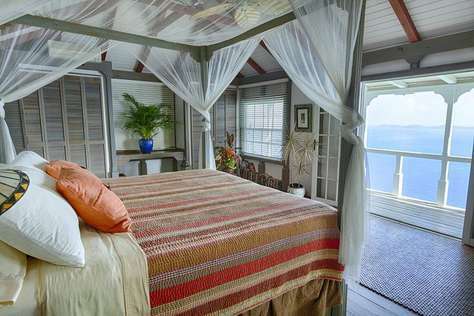 This sequestered air conditioned/fully screened suite offers a carved mahogany four-poster bed, with luxurious linens and West Indian furnishings. Screened French doors lead to the veranda and a cool outdoor private terrace with comfortable chaise lounges for two. There is a spacious en suite bathroom with double vanity, big tiled shower and freestanding bathtub; a walk in closet adjoins the bathroom, with plentiful storage and luxury bath robes for your use. On the south side of the Main Pavilion is a manicured lawn with spacious terrace, overlooking the yachts below at Sopers Hole. From the main entrance of the Main Pavilion, a walkway meanders through the lush gardens to the Oriental Cottage, tucked just far enough away from the main pavilion to provide romantic privacy. This air-conditioned cottage features a king bed with luxurious linens, a bath with large tiled shower and a separate W.C. The King suites have luxurious linens, flat screen TV/DVD players, Ipod docking stations, and tea and coffee making facilities with refrigerator. Both suites have large tiled en suite baths with double vanities. 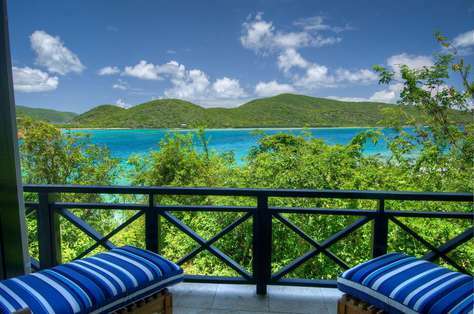 Comfortably furnished verandas look out over the bustling marine activity below in Sopers Hole and out to St. John beyond. 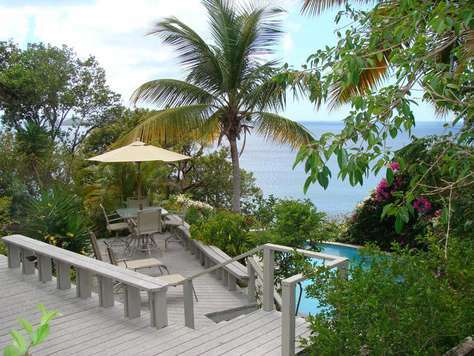 This separate air conditioned cottage has a beautiful four poster Queen sized bed with luxurious linens, large en suite tiled bathroom with separate W.C, and a wrap around veranda overlooking expanses of ocean and green islands and cay's with views as far as St. Croix. 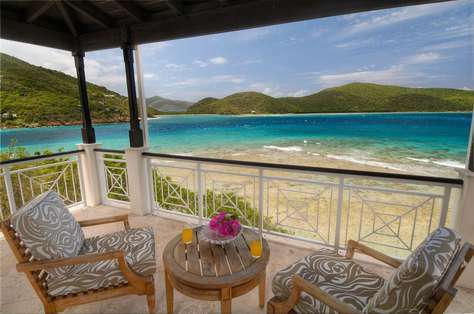 Enjoy the large infinity pool overlooking Smugglers Cove, Long Bay Beach and outstanding views to Jost Van Dyke. A fully equipped Gym is on site, air conditioned. 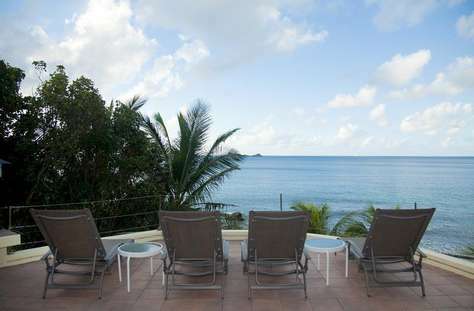 Murray House is a spacious and comfortable villa that is conveniently located in Long Bay, West End. The views are beautiful of course, and all rooms except the bathrooms, have ocean views. The accommodations are housed in 3 pavilions surrounding the fantastic pool deck and access to the beach below is just a 3 or 4 minute walk.....to a mile of white sand beach! This villa is particularly suited for guests who have difficulty getting around as the Master Suite is on the ground floor which has no steps at all. The bedrooms have all been newly furnished with handmade Balinese teak pieces summer 2015. The kitchen also has been redecorated and is very fresh and bright. Every room is now fully screened and the bedrooms are air-conditioned. From the driveway (which comfortably parks 2 cars), you enter the Great Room with its large and comfortably cushioned elephant bamboo furniture for at least 8 guests. 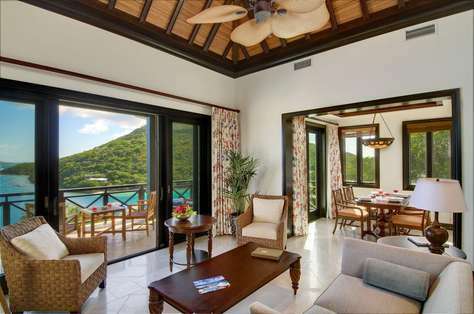 Across the room 3 sets of large glass doors open to reveal a large covered porch and ocean views of Jost Van Dyke, Sandy Cay and Green Cay. Large powerful fans silently cool the room with the ocean breezes which flow through the 3 walls of open double doors and the 1 wall of windows. There is a 32" flatscreen TV with DVD player and DirectTV for your entertainment. The shady porch area is an ideal spot for reading quietly in the shade with 2 large chairs and ottomans and it also has a secondary dining table and chairs for 4. This porch leads around to the large pool deck which is partially covered, offering guests space in the sun or shade on the 4 sun-loungers and 2 upright chairs. Also leading onto the pool deck is the large kitchen, which offers all the usual conveniences including a dishwasher. The laundry facilities are available for your use and are housed just off the kitchen as is a 1/2 bathroom and separate access to the driveway. The built-in gas grill is under the covered porch leading from the kitchen to the covered dining area that offers seating for 8. As previously mentioned, the Master Suite is on the ground floor, next to the pool. It has a hand made teak king size four-poster bed, a small private porch with chairs and ottomans for 2 and a further private sunning deck. There is a 32" flatscreen TV with DirectTV and a large walk0in closet, bathroom with walk-in shower and twin vanity. Winding steps from the pool deck lead up to the 2nd and 3rd suites which share a large deck overlooking the pool and ocean beyond, a nice shady area to share a cocktail or read a book. The 2nd suite has a king size bed, AC, 27" flat screen TV with DirectTV and the bathroom has a private alfresco stone-wall shower. The 3rd suite has a twin beds, a 27" flat screen TV with Direct TV and bathroom with private alfresco stone-wall shower. 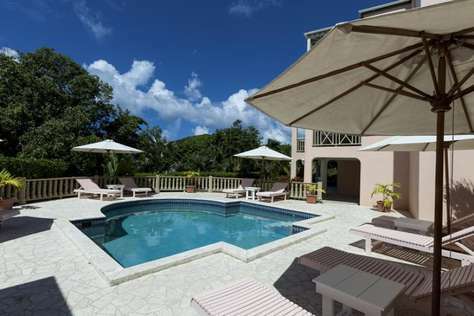 Murray House is a fantastic choice for anyone looking for the quiet of Belmont and West End but the proximity to the beach and restaurants that Long Bay offers. Maid service is once midweek or every 4 days for longer stays, and she will change all linens and towels as well as do a general clean. Laundry facilities are available for your use.